US $ 2700 per person in Dormitory of 8 people. Donation mentioned here are for a person for non-Indian or non resident Indian nationals. The course donation includes tuition as per the daily schedule shown below, food and accommodation, course text books & manuals, 2 sets of uniforms and the use of ashram facilities. This four-week course offers a profound personal experience, designed to build a firm foundation of inner discipline and provide the proficiency to teach yoga to others. The essence of yoga is learned through a combination of repeated practices and inspirational lessons. The approach to teaching is personal, focusing on the individual student. Among the many benefits students report are increased strength and flexibility, greater spiritual awareness, improved power of concentration, enhanced self-esteem and a new found sense of self-discipline. This training course fulfils the requirements for the Yoga Alliance 200-hour certification, for which graduates of the program are welcome to register. This course is open to all students who wish to deepen their knowledge and application of some of the highest teachings of yoga. 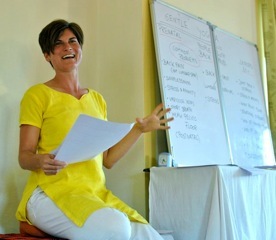 Participants do not need to be yoga teachers. Mastery of any yoga practice is not necessary... only your sincere desire for knowledge and your commitment to personal growth. Even if one does not wish to be a yoga teacher, one may attempt this course for the deeper understanding of the philosophies as well as for the intense purification experience and for all round development of the personality. • The four paths of Yoga: Karma Yoga (selfless service), Bhakti Yoga (the path of devotion, including attendance at devotional rituals); Raja Yoga (mind control), and Jnana Yoga (the path of wisdom and realisation). 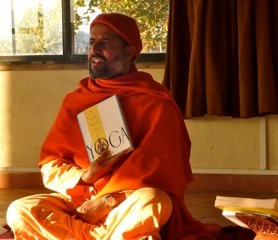 • Sivananda Training Manual – by Sivananda Yoga Vedanta Centre. * These texts are included in the course donation. The students are continuously assessed throughout the course at all levels. Participant should pass all different aspects of the course to be eligible for the course diploma. There will be a written exam at the end of the course to evaluate the understanding of the philosophy of Yoga and skills of the students. 7. Written examination of 3.30 hrs on the theories of Yoga and Vedanta philosophy. Upon successful completion of the course students receive the Certificate of the Sivananda Yoga Vidya Peetham. This training course fulfils the requirements for the Yoga Alliance 200-hour certification, for which graduates of the program are welcome to register. Please read course details as well as the course location information carefully before making a decision to register. Total number of participants for any course is around 50.